This book was published in 1979 on behalf of the Aviation Historical Society of Australia. It was the story of the Qantas Empire Airways secret wartime flights from Perth to Ceylon and Karachi, conducted in radio silence through Japanese controlled airspace. 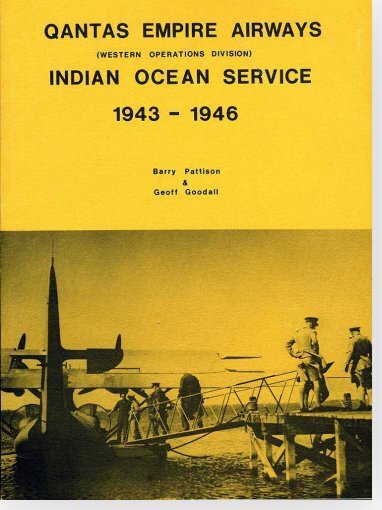 The service commenced in 1943 using Consolidated Catalinas transferred from BOAC, which took an average of 29 hours between Perth and Lake Koggala in Ceylon, although one trip was airborne for 32 hours. The few high priority passengers on each flight were awarded a certificate The Secret Order of the Double Sunrise, which is reproduced in colour in the book. Consolidated Liberators and Avro Lancastrians were later introduced on the route. This book was the result of a joint research between Geoff Goodall and Barry Pattison, which proved to be an enjoyable and productive project. A number of surviving Qantas pilots and engineers were interviewed and their first-hand recollections and logbooks were invaluable to document an authoritative history. The book sold out within a few years. I have commenced on a long-term project to publish a revised edition, to incorporate the significant additional detailed information collected over the intervening years.